Who among us hasn’t experienced lack of energy or tiredness, often at the most horrible times, when we just want to get things done? During working hours, if you feel tired or feeling lazy, just do a little exercise like to get up from the chair, stretch a little, walk around the office, and then continue working at the standing desk. A little movement in your body helps to refresh instantly. Exercise also boosts your body’s oxygen-carrying capacity and improves circulation, so said oxygen will get in touch with and “feed” all your body parts faster. 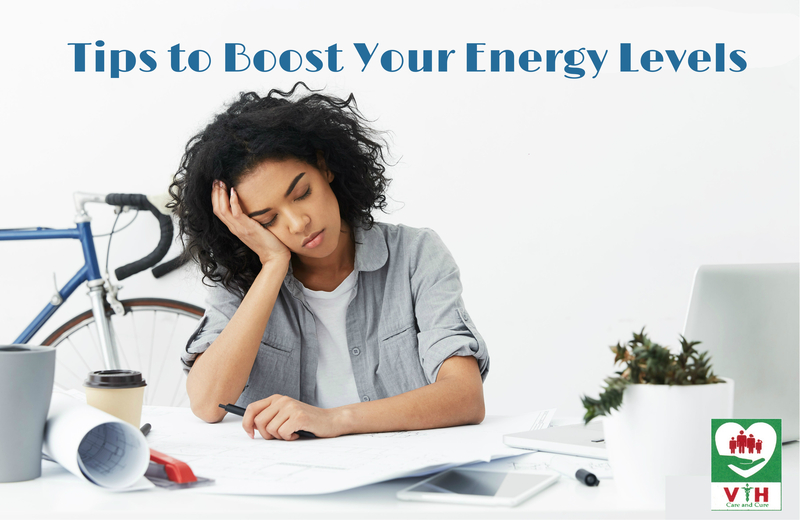 Practicing yoga and meditation is the best tips to boost your energy levels. Because, both yoga and meditation practices focus on techniques, such as mindful breathing, that helps to support a state of peace. A study says that, people who exercise, yoga and meditation often have good immune systems and to have enlarged flexibility in the face of stress and anxiety. One of the main sources of energy is, the food we eat daily. If you want to keep your energy levels higher, you must eat healthy and nutritious foods. Measure the energy that you can obtain from foods in calories. If you don’t consume enough calories, your bodies definitely feel tired. At the same time, if you get more number of calories, then you feel sluggish. So, in order to feel fresh and always energetic, you must learn to sustain a balance in calorie intake. It is very important to make sure that you must take enough quality of sleep at night to prevent stressful activity throughout the day. Venkataeswara Hospitals always advice, many of us often don’t skip your sleeping time, because good sleep makes you feel better for the next day.